Change is Good. Really Good. 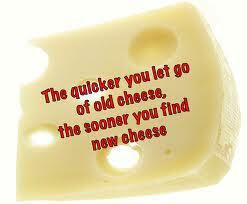 “Life moves on and so should we” ~ Spencer Johnson, Who Moved My Cheese. Have you ever read that life-changing little book? It comes to mind when I think of how life can take you in directions you never could have predicted and all at precisely the time you need it most. Here at The Healing Station it seemed it was simply “meant to be” that we move out of our Plaza Drive location after five years there. We had, after all, experienced a major break-in and ever since that incident, we never felt safe. Our new digs in a classy office building at Folsom’s 101 Parkshore Drive are very different-looking from our old center, but we think you’ll agree it’s a good change. Clients enter a classy, hotel-like slate and stone lobby and are “announced” by the lobby receptionist, after which we arrive to guide you back to our nearby treatment rooms. The same services, commitment to excellence, and signature attention to details are all administered in an efficient, quiet, intimate setting. So the excellence The Healing Station is known for is still here – with a twist! As Marc and I look forward to retirement age, we have to be honest; simplifying our lives has been a goal after having had long-term careers, run businesses and brought up our amazing kids. So when landlord changes began to take place at our old location, it was the ideal time for us to look for a way to accommodate that new direction in our lives. For me, it means eventually having the luxury of working fewer hours as well as now having the ability to pamper my clients even more. For Marc, it’s a matter of stopping to smell the coffee for even longer periods of time while he upholds his reputation as a social butterfly. Specials to introduce you to our new location include 65 minute massage and Replenishing Facial for $59.95. Please follow us on Facebook and give us a call to set up your next service and visit our web site often! Chan a certified Massage therapist and specialist in skin care in Folsom, CA offers specialized treatments at The Healing Station, located at 101 Parkshore Drive, Suite 100. The Healing Station is a Folsom-based alternative health and wellness spa that offers a wide range of skin and body care services. These include reviving massages, pampering facials and peels, elegant eyelash extensions, soothing body treatments, and waxing. For more information, visit http://www.thehealingstaton.net.